While web surfing one day for something a little different and a little indulgent, I came across this little number. It takes a traditional food that we all know, ravioli, and gives it a little kick of magic (and by magic I mean, chocolate, and chocolate IS magic, in my opinion). The dough is a standard ravioli dough, sweetened with a little cocoa, so it isn't super rich, but when paired with the right fillings and an indulgent sauce, which you can adjust, it is just heavenly. I adjusted the filling recipe, because it just didn't seem thick enough. That adjustment is shown when you click into the recipe. However, create your own fillings! I think something rich and caramel, or raspberry would be divine. Since the dough is not super rich, you can go nuts on your filling and get your sweetness there. OOOhhh, or nutella filling and sauced with caramel and chopped hazelnut? This would be a perfect valentines, spoil you and a loved one dinner date night in. Maybe after the kids have had their chicken nuggets and gone to bed type of dinner or dessert. If you have never made ravioli, it is really not as intimidating as it sounds. Ravioli presses come in many shapes. Some are square, some are rectangle, some ravioli molds or presses make round ravioli, like the one shown. Some ravioli presses squish it together, and some cut them out like cookie dough. There are presses that cut one piece at a time, and then there are presses that do a dozen at a time. Some ravioli is cut with a wheel, it looks like a funny pizza cutter. The press I currently have on my wishlist cuts out many at a time AND has a mold to put filling in, which I think would take the guess work out when trying to figure out how much filling is needed. The important part of a press is that you want the filling all sealed inside the dough, protecting the little pillow of goodness. Here are some more ravioli tips if you are beginner to make it a little less intimidating. When making your dough, don't add too much flour. You want some elasticity so the dough stretches around the filling. Air is bad, it will cause your little ravioli to explode, this is not what we want. Fill with enough filling so you don't have extra air space. Flour your press well so the dough does not stick, some presses may require cooking spray. When I made this recipe, I added powdered sugar to the filling mixture, until it was very thick, this is reflected in the written recipe for you. What ideas have you come up with for your fillings? A lightly chocolate flavored ravioli, when filled with rich fillings, is a twist on a traditional favorite. Into a large mixing bowl add: flour, cocoa, 3 eggs. Using your mixer, start off slowly until ingredients are incorporated. Gradually stream in water while mixer is running and a dough ball has formed. While dough is resting making filling. Into a small bowl add: mascarpone, 1 egg, 2 tablespoons sugar, powdered sugar, vanilla and mint. Mix until well incorporated. Transfer to refrigerator until ready to use. To assemble: Lightly dust clean work surface with flour. Place one pasta sheet on the work surface. Place a teaspoon of filling every 3 inches down the pasta sheet. Fold the dough over, and press around filling to seal. 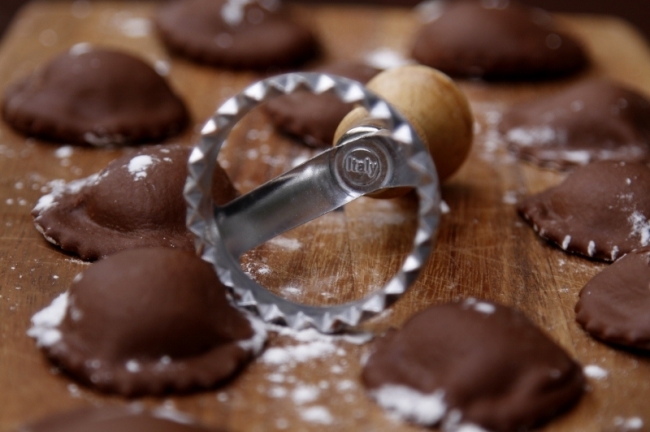 Using a 2" ravioli cutter (or pastry wheel) cut out ravioli. Set ravioli on a baking sheet lined with a silicone mat or parchment paper. Continue with remaining dough. Refrigerate until ready to cook. To cook the ravioli, bring water and 2 tablespoons of sugar to a boil in a large pot. Add ravioli (do not crowd pot, do this in batches). When pasta floats to the top leave it for an additional 2 minutes or until al dente. Remove ravioli with a slotted spoon. Drizzle with sauce of choice.